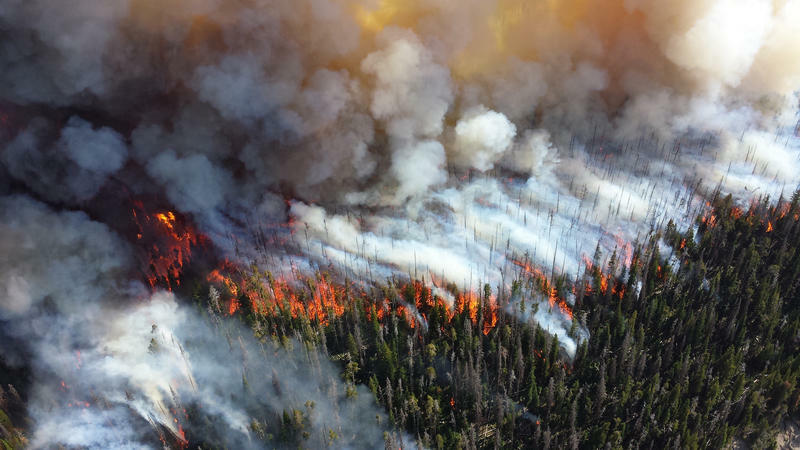 This summer's Pole Crek Fire was the hird largest wildfire in modern Utah history. The National Climate Assessment, released Friday, says the Southwest is vulnerable to more extreme wildfires in the future because of climate change. The Trump administration released the fourth and latest version of the National Climate Assessment on Friday. The congressionally mandated quadrennial report zeroes in on hazards nationally and region-by-region. For the Southwest, the assessment predicts more extreme wildfires and less reliable water supplies. Peter Howe, an assistant professor of geography at Utah State University’s Department of Environment and Society, studies what people think about climate change. KUER’s Judy Fahys asked Howe about how the latest report might affect Utah’s attitudes towards global warming. Peter Howe: Utahns are similar to the rest of the country in some ways. Most of us think that climate change is happening — about two-thirds of Utahns think that climate change is happening. So, there's broad agreement on that front. There's more disagreement on to what extent humans are causing climate change. About 57 percent [of Americans] say that humans are the main cause of climate change. And a majority in Utah believe that as well, but it's just 51 percent. USU's Peter Howe, a member of the research team behind the Yale Climate Opinion Maps, says just over half of Utahns believe that humans cause climate change, slightly less than the national average. Judy Fahys: Based on your research, how much impact will the latest climate assessment have on what people in Utah think about climate change? PH: Even though people think climate change is happening, they tend to think that it is a distant problem, affecting people farther away from us, more likely to affect plants and animals or affect polar bears, for example. It's still not something we have localized and think of as affecting us personally. One of the major takeaways of the National Climate Assessment is that climate change is affecting the U.S. now. It's affecting people all over the country, including people here in Utah. It is affecting our water supplies. It’s affecting the weather. It's affecting the snowpack, and it's likely to cause even greater impacts in the future. JF: What I hear in what you are saying is maybe this offers some hope for meaningful action. PH: There are a lot of things that we can do to reduce the risks of climate change. One of the most important things is transitioning to clean energy sources, and that's actually something people broadly agree on all over the country, including here in Utah. USU's Peter Howe is part of the research team behind the Yale Climate Opinion Maps. The latest opinion surveys from last summer reflect broad support nationally and in Utah for studying solutions to climate change, including clean energy. Some questions and responses have been edited for length and/or clarity. Three dozen Utahns joined activists nationwide in rallying behind a landmark climate lawsuit even though the U.S. Supreme Court has put the case on hold.